Why it is important Sports Training Vest While Playing a Match? Sports training bib, training vest, training mesh, sports vest and training vest are words common to this super important attire for an athlete. It refers to a garment that is used by a player on the field to identify him or herself during the game. Every bib or vest has a number. Even power lifters wear the training vests. It helps in easy identification of a player. The crowd is easily able to identify their favourite players. Also, the players on the field when they wear these vests feel a kind of belonging to the team or country. Moreover, these training vests act as great moisture absorbent. When on the field, players get all sweaty due to weather, thereby these vests help the players and it absorbs the excess moisture. The training bibs are comfortable and manufactured in a way that the players feel good on the field. The garment must never become an obstacle during the game play. 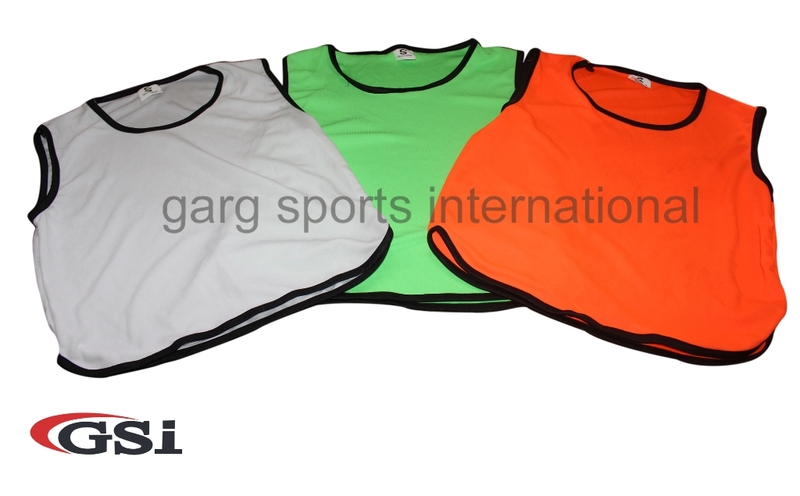 At Garg Sports International, we manufacture training vests that are of premium quality at affordable prices. The vests are comfortable and high performance in every sense. We strive to manufacture lightweight vests for players so that they feel great about it. These vests are stretchable as well as durable and long lasting. Corporate clients can also get customised designs and we can print or embroiled the logo. The training vest makes a player feel proud of not only the sport but also the team. We have reversible training bibs, adult mesh training bibs, comfort soccer bibs, reflective training pinnies, cricket t-shirt, hockey identification pinnies, striped mesh training bibs, adult training pinnies with Velcro, netball identification pinnies, football kit, promotional sports kit and other items. You can visit the sports clothing section, here. Like how the uniform of a military defines his duty and he or she is proud of it. Similarly, sportswear defines sportsmanship in an athlete. The most crucial when a sportsperson starts training is buying a good quality sportswear or sports apparel. It acts as a motivational thing for people who want to start training or gym with style as well as comfort. Also, it is important to choose the right sportswear as it takes into consideration the kind of sport you are willing to take up. The perfect look is crucial as it will help you build self confidence. Different sports require a person to wear a different kind of sportswear. Some sports are more physical in nature than others. If the person does not wear the right sportswear then chances are that it can lead to an injury or accidents. The right kind of sportswear allows a sportsperson to move freely with no hassles whatsoever. Garg Sports International expertises in manufacturing high quality sports clothing for athletes. GSI has reversible training bibs, netball identification pinnies, adult mesh training bibs, comfort soccer bibs, hockey identification pinnies, reflective training pinnies, adult training pinnies with Velcro, striped mesh training bibs, cricket t-shirt, track suit, cricket kit and football kit. GSI also manufactures promotional sports t-shirt for companies as per their needs. The t-shirts can be customized according to the need and logo can be printed on the same. Football fever is on due to 2014 FIFA World Cup and the sport requires a player to wear should pads, knee pads and the jersey. The sportswear also looks quite stylish as they portray the right kind of attitude. When a person plays a sport wearing a sportswear then it means that he is serious about playing the game and is not just fooling around. Visit the GSI sports clothing section, here.